While you might associate working with images with big graphical programs like GIMP or Photoshop, ImageMagick is an entirely different animal. It is a suite of command-line programs for converting and manipulating images. But why would you use a command line program to work with images, which are by definition, graphical? Well, for a start, you don’t have to load up a slow (and dare I say bloated) graphical app just to achieve a simple conversion task: you can fire off the command and have the result done in no time. Also, you can go to pretty much any Linux computer and know that ImageMagick is available — its ubiquity makes it a useful tool to know how to use. 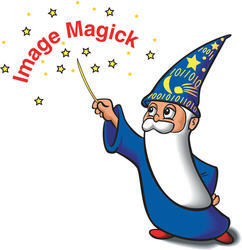 So let’s jump right in to doing some simple, but useful, conversion tasks with ImageMagick. If you have, say, a PNG file that you want in JPEG format, you can simply run convert with the source filename and the desired destination filename, and it will infer the desired format from the destination’s file extension. To resize an image with ImageMagick, you can use the -resize command line switch to resize by either a percentage, or with the exact desired dimensions. Note that resize will preserve the aspect ratio of your image, even if you choose exact dimensions that are in a different ratio. If you want to squeeze down the file size of an image in a lossy compressed format, such as JPEG, you can instruct convert to change the quality attribute. So, say you have a folder full of PNG files that you now need in JPEG format. With many applications, you would have to go through the laborious process of opening each image and using Save as to save the file in the new format. If an image has too much space around the edges, you can use trim to automatically crop the image. This feature removes any edges that are exactly the same colour as the pixels at the corner of the image. We really are only scratching the surface of this powerful suite of applications. There is extensive documentation on all its features and there is certainly more to explore if you find yourself using ImageMagick a lot.